One can never quite expect what themes or subjects will be apparent across multiple films at a festival, but from their titles alone, it was apparent at this year’s Sundance. The festival featured the world premieres of both The Stanford Prison Experiment and Experimenter, with the latter looking at the work of Stanley Milgram. Now set for a fall release, the first trailer has arrived which sells a potentially compelling drama about how far one is willing to go when asked. Coming from director Michael Almereyda, who knows drama well with his Shakespeare adaptations, we didn’t catch it at Sundance, but are looking forward to seeing it come October. Starring Peter Sarsgaard, Winona Ryder, Kellan Lutz, Taryn Manning, John Leguizamo, Jim Gaffigan, Edoardo Ballerini, Dennis Hyasbert, Danny Abeckaser, and Anton Yelchin, check out the trailer and poster below. Yale University, 1961. Stanley Milgram (Peter Sarsgaard) designs a psychology experiment that still resonates to this day, in which people think they’re delivering painful electric shocks to an affable stranger (Jim Gaffigan) strapped into a chair in another room. Despite his pleads for mercy, the majority of subjects don’t stop the experiment, administering what they think is a near-fatal electric shock, simply because they’ve been told to do so. With Nazi Adolf Eichmann’s trial airing in living rooms across America, Milgram strikes a nerve in popular culture and the scientific community with his exploration into people’s tendency to comply with authority. Celebrated in some circles, he is also accused of being a deceptive, manipulative monster, but his wife Sasha (Winona Ryder) stands by him through it all. 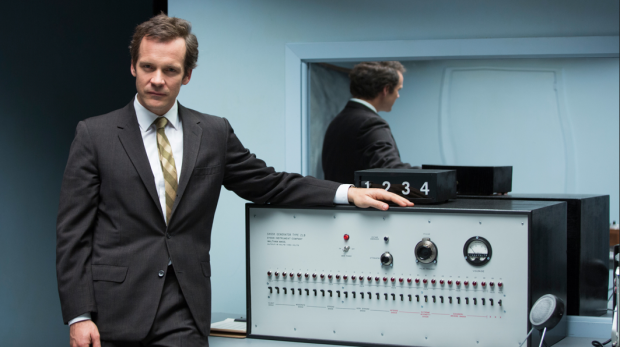 EXPERIMENTER invites us inside Milgram’s whirring mind in this bracing portrait of a brilliant man whose conscience and creative spirit continues to be resonant, poignant, and inspirational. Experimenter opens on October 16th.